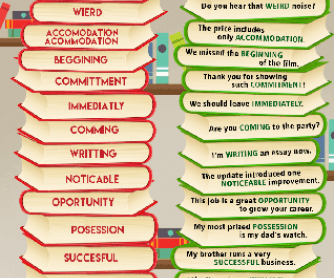 This infographic depicts most common spelling mistakes English language learners make. You can use it as a classroom poster. In addition, you can use it to revise spelling with your students, or to check if these particular words cause them trouble. Your students will first see the misspelled word and then the correct spelling, illustrated in a sentence.